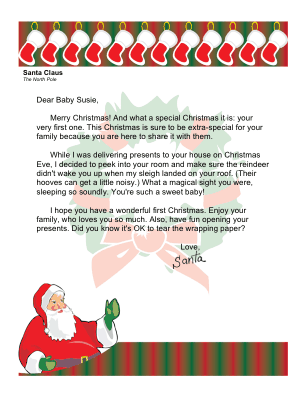 How special it would be for a baby to awaken to this letter from Santa on Christmas morning! Intended for baby's first Christmas. Merry Christmas! And what a special Christmas it is: your very first one. This Christmas is sure to be extra-special for your family because you are here to share it with them. While I was delivering presents to your house on Christmas Eve, I decided to peek into your room and make sure the reindeer didn't wake you up when my sleigh landed on your roof. (Their hooves can get a little noisy.) What a magical sight you were, sleeping so soundly. You're such a sweet baby! I hope you have a wonderful first Christmas. Enjoy your family, who loves you so much. Also, have fun opening your presents. Did you know it's OK to tear the wrapping paper?